Americans are apprehensive about a future in which machines take on more of the work now done by humans, and most are supportive of policies aimed at cushioning the economic impact of widespread automation, according to a new Pew Research Center survey. The vast majority of Americans (85%) say they would support restricting workforce automation to jobs that are dangerous or unhealthy for humans to do, including 47% who support the idea strongly, according to the survey, conducted May 1-15 among 4,135 U.S. adults. A smaller majority (62%) would favor giving consumers the option to pay extra to interact with a human, rather than a robot or computer, when purchasing products or services. Most Americans also see a policy role for the federal government, specifically. Six-in-ten say they would favor a federal policy that would provide a guaranteed income for all citizens to meet basic needs if robots and computers become capable of doing many jobs now done by humans. And 58% say they would support a federal service program that would pay people to do tasks even if machines are able do the work faster and more cheaply. More broadly, a majority of Americans (58%) say there should be limits on the number of jobs that businesses can replace with machines, even if those machines are better and cheaper. Fewer respondents (41%) took the opposite view that businesses are justified in replacing human workers, even if machines can do the work better and at a lower cost. The public is more divided on the question of who bears responsibility for taking care of displaced workers in the event of widespread automation. Half say it is the government’s obligation, even if it means raising taxes substantially. Nearly the same share (49%) says it’s the obligation of individuals, even if machines have already taken many human jobs. While majorities of Americans support policies that would regulate the pace of automation, Democrats and Republicans have sharply different views on some of them, particularly those involving the government. Democrats and Democratic-leaning independents are twice as likely as Republicans and Republican leaners to say they support the federal government providing all Americans with a guaranteed income if computers and robots become widely competitive with humans (77% vs. 38%). Democrats are also substantially more likely than Republicans to favor a federally run service program for displaced workers (66% vs. 46%). When it comes to who bears responsibility for taking care of workers displaced by machines, Democrats are far more likely than Republicans to say it’s the government’s obligation, even if it means raising taxes substantially (65% vs. 34%). Republicans are much more likely than Democrats to say it’s the responsibility of individuals, even if machines have already taken many human jobs (68% to 30%). On other questions related to automation policies, there are smaller or no partisan differences. 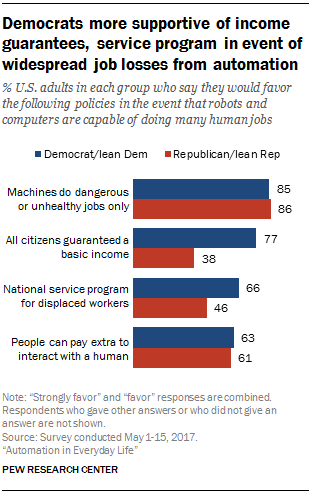 For example, large majorities in both parties (85% of Democrats and 86% of Republicans) say workforce automation should be primarily limited to jobs that are dangerous or unhealthy for humans to do. And about six-in-ten in each party (63% of Democrats and 61% of Republicans) support allowing consumers to pay extra to interact with a human when buying goods or services. Americans’ views on some policies also differ markedly by educational background, with less-educated respondents more likely than more-educated adults to favor restrictions on automation. For instance, while seven-in-ten Americans with a high school diploma or less say there should be limits on the number of jobs businesses can fill with machines, the share falls to 59% among those with some college experience and 41% among those with a college degree.